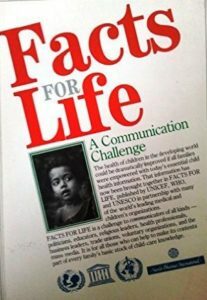 In 1988, P&LA proposed the idea of Facts for Life, – a publication that would bring together the essential knowledge about child health that “every family now has a right to know.” In the hands of communicators of all kinds – teachers, health workers, NGOs, journalists and broadcasters – this was knowledge that could help to protect the lives and the normal, healthy development of children in the developing world. After consulting with more than one hundred leading paediatricians and child health experts in dozens of countries, Facts for Life was written and produced by P&LA for joint publication by UNICEF and the World Health Organization. A companion volume – Health for All – was written by Glen Williams and produced by P&LA as a guide for communicators on why and how to use Facts for Life. Regularly updated, Facts for Life became part of the school curriculum and health worker training in over 50 countries. Today it is a joint publication of eight major UN agencies – UNICEF, WHO, UNESCO, UNFPA, UNDP, The World Food Programme, UNAIDS, and the World Bank. View The Economist on Facts for Life. First published in 1989, Facts for Life has been revised and re-issued many times and is now jointly published and distributed by seven UN agencies and the World Bank.